Universal Login allows an administrator to create a trader ID and password that is mapped to each exchange the trader would like to connect to. Instead of using the Exchange Login dialog box within X_TRADER® to log into each exchange, Universal Login allows the trader to log into potentially many exchanges at once using one ID. 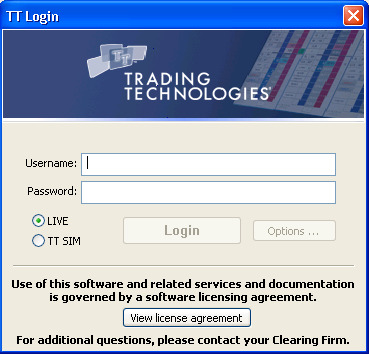 To use universal login, the environment must contain a running TT User Setup server.The administrator connects to the TT User Setup server to create and manage the trader's universal login, and the trader's X_TRADER workstation connects to the TT User Setup Server to authenticate the trader's login. For more information about TT User Setup refer to the TT User Setup Online Help or TT User Setup User Manual. Note: Before performing a Universal Login, the feature must be enabled by checking the Enable Universal Login option on the Config menu. On the File menu, click Universal Login. In the Username field, type your user name and press TAB. Select LIVE to log in using non-TT SIM mode. This is the default option. Note: For more information about TT SIM mode, refer to the TT SIM Quick Reference Guide and the TT SIM Feature Guide. To log into the default exchanges,click Login. If your username or password is incorrect, or if the administrator has not configured your user name for your selected login mode (i.e. LIVE or TT SIM), Guardian will display an error. 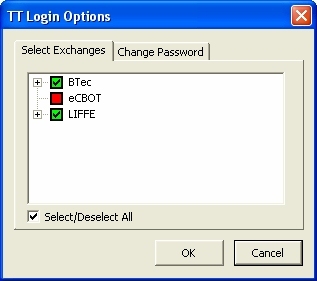 To log into specific exchanges, click Options (not available in TT SIM mode). The TT Login Options box displays. On the Select Exchanges tab, click the exchanges to which you want to log in.